Surfactin, one of the most powerful microbial surfactants, is a lipopeptide-type biosurfactant which combines interesting physicochemical properties and biological activities. However, the high cost caused by its low productivity largely limits the commercial application of surfactin. Hence, many engineered bacterium have also been used to enhance surfactin biosynthesis. 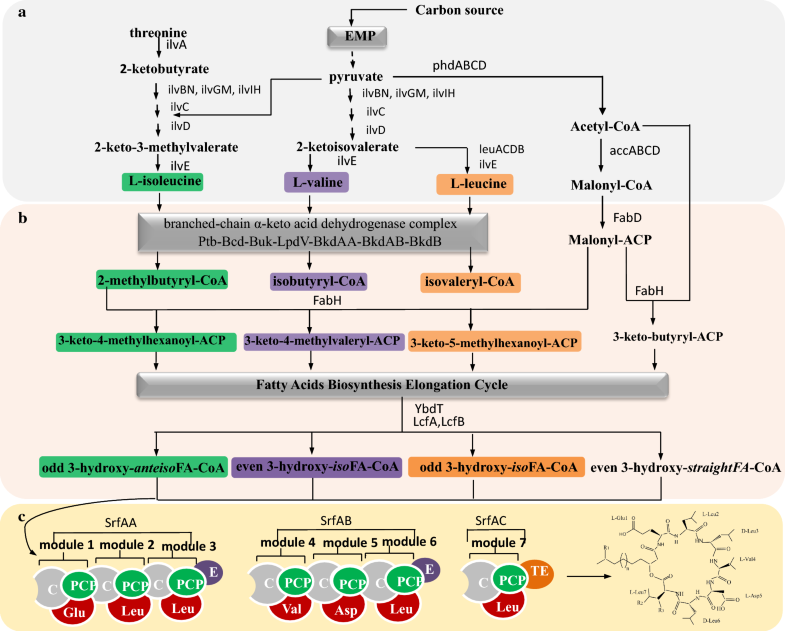 This review briefly summarizes the mechanism of surfactin biosynthesis, highlighting the synthesis pathway of N-terminally attached fatty acids, and outlines the main genetic engineering strategies for improving the yield and generating novel structures of surfactin, including promoter engineering, enhancing efflux systems, modifying the transcriptional regulatory genes of surfactin synthase (srfA), genomics and transcriptomics analysis, non ribosomal peptide synthetase (NRPS) domain and combinatorial biosynthesis. Finally, we discuss the future prospects of the research on surfactin. Since green chemicals and industrial processes have become a concern for the whole society, environmentally-friendly, biodegradable biosurfactants with low toxicity have aroused great interest [1, 2]. Biosurfactants are classified into glycolipids, phospholipids, fatty acid lipopeptides, lipoproteins, polymeric surfactants and particulate surfactants based on their natural chemical structure and microbial origin [3, 4]. Lipopeptides constitute a class of antimicrobials composed of a hydrophilic peptide ring and hydrophobic fatty acid moieties [5, 6]. According to their structural characteristics, lipopeptides can be divided into cyclic lipopeptides (CLPs) and linear lipopeptides [7, 8]. The cyclic lipopeptides that have been discovered so far, including fengycin, iturin and surfactin, are mainly produced by Bacillus subtilis [9, 10]. These lipopeptides all have a peptide ring of 7 or 10 amino acids with a long hydrophobic fatty acid chain. The fatty acid chain lengths differ, whereby that of surfactin is C13–C16, iturin’s chain is C14–C17, and that of fengycin is C14–C18. Surfactin, a secondary metabolite first discovered in the culture broth of B. subtilis in 1968 , is the most well-known lipopeptide with broad-spectrum antibacterial activity. Surfactin has a ring-shaped peptide chain containing seven amino acids, and a β-hydroxy fatty acid chain of 13–16 carbon atoms as shown in Fig. 1 . Because of some differences in the length of the fatty acid chain and the types of amino acids, surfactin has many congeners or isoforms . Due to its unique structure, surfactin can not only lower the surface tension of water from 72 to 27 mN/m, but is also highly thermally stable and salt tolerant [14, 15]. Thus, it has great potential in both enhanced oil recovery (EOR) and the microbial enhancement of oil recovery (MEOR) [16, 17]. In addition, surfactin has been considered as a good candidate for use in bioremediation of contaminated soils and subsurface environments . Although surfactin has potential therapeutic applications of anticancer therapy and environmental applications , it cannot compete with synthetic chemical surfactants due to its high cost and low yields. In order to reduce the cost, several waste materials such as feather hydrolysate waste, glutamate mill waste and distillers’ grains have been tested as carbon sources for the production of surfactin, but the yields were about 500 mg/L, much lower than those (> 1000 mg/L) in defined medium [20–22]. In recent years, many studies on enhancing the production of surfactin have been of particular interest. Fermentation parameters including pH, temperature, agitation speed, oxygen supply, medium composition and fermentation strategies are all important factors in surfactin production [3, 23–25]. However, with the development of genetic technology, rational engineering of strains for improved surfactin production has attracted more and more attention. This review provides a general overview of the biosynthesis and genetic engineering strategies for enhancing surfactin production and generating novel surfactin variants. Especially, the synthetic mechanism of surfactin is not only discussed in terms of non-ribosomal peptide synthetases (NRPS); also, the biosynthesis of branched-chain fatty acids and branched-chain amino acids will be highlighted. Surfactin is one of the most prominent and well-studied members of the class of lipopeptides. Surfactin is synthesized by large multifunctional NRPS that contain three modules, SrfAA, SrfAB and SrfAC, which compose a linear array of seven modules (one module per residue) with each module being responsible for the addition of one amino acid [26, 27]. Each module contains at least three catalytic domains: an adenylation domain (A) is responsible for the selection and activation of the substrate, a small peptidyl carrier protein (PCP) carries the aminoacyl-adenylate substrate as enzyme-bound thioester, and a condensation (C) domain forms the peptide bonds between the acyl-S-PCP intermediates [28, 29]. Epimerization (E) domains perform the stereochemical conversion to yield the d-isomer of some of the incorporated residues. An additional thioesterase (TE) of the termination module catalyzes product release by either hydrolysis or macrocyclization, to generate either cyclic or cyclic-branched molecules [30, 31]. The synthesis process of surfactin can be separated into three parts, the initiation of synthesis, the elongation of the peptide chain and the cyclization of the peptide chain. The first module (C-AGlu-PCP) of surfactin synthetase SrfAA is responsible for the lipoinitiation reaction . The donor site of the starter C domain has a very distinct specificity for the chain length of its 3-hydroxy fatty acid substrate. Although the N-terminally attached fatty acids are key structural elements of surfactin, few researchers paid attention to their biosynthesis pathway [33–35]. Among the produced surfactin variants, those with branched-chain fatty acids are the main component, accounting for about 78% of the total . Hence, the fatty acid biosynthesis system, especially that for branched-chain fatty acids, is also critical for the synthesis of surfactin in addition to NRPS. Beta-ketoacyl-acyl carrier protein synthase III (FabH) catalyzes the condensation of malonyl-acyl carrier protein (ACP) with acetyl-CoA to form β-ketobutyryl-ACP, which is the initial step of straight chain saturated fatty acid biosynthesis. However, the FabH of B. subtilis can initiate the straight- and branched-chain fatty acid synthesis cycle by condensing acetyl-CoA, isobutyryl-CoA, isovaleryl-CoA or α-methylbutyryl-CoA with malonyl-ACP, and it showed higher activity and selectivity for branched-chain fatty acid synthesis precursors [36, 37]. In Bacillus, the branched-chain fatty acid phospholipids are the main components of cell membrane phospholipids, accounting for 96% of total phospholipids (iso-C14: 0, 4%, iso-C15: 0, 24%, iso-C16: 0, 12%, iso-C17: 0, 13%, anteiso-C15: 0, 34%, anteiso-C17: 0, 9%, normal-C16: 0, 4%) . The branched-chain fatty acid synthesis precursors isobutyryl-CoA, isovaleryl-CoA and α-methylbutyryl-CoA can be derived from the branched-chain amino acids l-valine, l-leucine and l-isoleucine, respectively. Thus, the biosynthesis of branched-chain amino acids and branched-chain fatty acids also greatly influences surfactin biosynthesis. As shown in Fig. 2, the process by which the branched chain amino acids l-isoleucine, l-valine and l-leucine participate in surfactin biosynthesis was divided into three parts: branched-chain amino acids biosynthesis, branched chain fatty acid and CoA-activated 3-hydroxy fatty acids precursor biosynthesis, and NRPS-catalyzed synthesis. The biosynthesis of the branched-chain amino acids l-isoleucine, l-valine and l-leucine shares the same enzyme system encoded by ilvBN, ilvGM, ilvIH, ilvC, ilvD, and ilvE [39, 40]. Especially, the production of l-leucine from the intermediate precursor α-keto-isovalerate involves an enzyme complex encoded by leuACDB. The resulting intermediates are converted into the corresponding branched-chain acyl-CoA precursors: α-methylbutyryl-CoA, isobutyryl-CoA, and isovaleryl-CoA through the branched-chain α-keto acid dehydrogenase complex . Subsequently, these branched-chain acyl-CoAs and malonyl-ACP are condensed to yield 3-keto-4-methylhexanoyl-ACP, 3-keto-4-methylvaleryl-ACP and 3-keto-5-methylhexanoyl-ACP by the action of FabH . At the same time, acetyl-CoA is condensed into 3-keto-butyryl-ACP which is the precursor of straight chain fatty acids. Then, these fatty acyl precursors enter into the fatty acid biosynthesis elongation cycle to produce corresponding branched- and straight-chain fatty acids, as shown in Fig. 2 . Next, the respective fatty acids are hydroxylated by the cytochrome P450 enzyme YbdT, which was proved to be responsible for the 3-hydroxylation of long chain fatty acids (LCFAs) [44, 45]. The subsequent activation of 3-hydroxy LCFAs occurs via the activity of acyl-CoA ligases LcfA and LcfB in B. subtilis . The final CoA-activated LCFAs are recognized as substrates for the initiation of surfactin synthesis. The importance of branched-chain amino acid and branched-chain fatty acid synthesis was recently confirmed by transcriptome analysis. The genome and transcriptome analysis of B. amyloliquefaciens MT45, a high-producing strain with a surfactin titer of 2.93 g/L, showed that most genes in fatty acid synthesis pathway were upregulated compared with B. amyloliquefaciens type strain DSM7T, which produced much less surfactin . Furthermore, genes participating in acetyl-CoA generation, which is a precursor of fatty acids, were also particularly upregulated. Likewise, the results of our recent work showed that Bacillus velezensis BS-37 , a surfactin high-yield strain, were in agreement with the transcriptome analysis. Moreover, the surfactin production of strain BS-37 doubled to nearly 2 g/L with the addition of 10 mM l-Leu, which was consistent with a previous report that surfactin production could be increased 20.9-fold by strengthening the leucine metabolic pathway . In addition to these findings, there were many studies that proved the importance of branched-chain amino acids and branched-chain fatty acids. For example, the deletion of the gene lpdV, encoding a part of the dehydrogenase complex responsible for the conversion of CoA-precursors to respective branched chain FAs, causing surfactin C14 isoform with straight FA chain was twofold more than the wild type. The research of Kraas et al. showed that the deletion of LcfA and LcfB, which were proposed to activate fatty acids for degradation, causing the production of surfactin to decrease by 84% . Most reported surfactin titers of wild-type bacterial producers are in the range of 100–600 mg/L. For example, B. subtilis BS-37 was reported to produce 585 mg/L , and B. velezensis H3 488 mg/L . It has been difficult to achieve significant breakthroughs in production only through traditional strategies of mutagenesis and breeding or fermentation optimization. Consequently, establishing genetically modified surfactin producer strains is of great significance. In terms of strain modification to improve the production of surfactin, there are mainly three strategies: (1) substituting the native promoters Psrf of srfA modules, which is important for surfactin synthesis; (2) strengthening the efflux of surfactin by overexpression of assistant proteins and surfactin transporters is also an effective way. (3) To modify the transcriptional regulatory genes of srfA. The production of surfactin requires the critical srfAB locus, which is a large operon of 27 kb controlled by the promoter Psrf. Because it is difficult to heterologously express srfA, promoter exchange has been regarded as a preferred way to improve the productivity of surfactin. There are three types of promoters often used in B. subtilis: inducer-specific promoters, constitutive promoters and autoinducible promoters . The best-known constitutive promoter is P43. The inducible promoter Pxyl is driven by xylose, Pspac is induced by IPTG. Auto-inducible promoters (e.g., Ppst and Pcry3Aa) can be used to express the target gene from the late log phase to the stationary phase . Psrf is an autoinducible promoter which is triggered by signal molecules acting in a quorum sensing pathway. The recent successes in promoter exchange to promote the yield of surfactin were achieved using natural high-yield strains [51, 52]. In an earlier study, Sun et al. used the IPTG-inducible hybrid promoter Pspac to replace the native Psrf promoter of B. subtilis fmbR, which resulted in a tenfold surfactin yield enhancement, to about 3.86 g/L . In addition to using natural strong promoters, synthetic promoters were also investigated, and perhaps the most remarkable result was achieved by Song et al. . They identified several strong native promoters (PgroE, PsacB and PsacP) in B. subtilis THY-7 through transcriptome analysis and confirmed the weakness of the native srfA promoter. However, the recombinant strains could not successfully synthesize surfactin using the strong constitutive PgroE core promoter. Afterwards, three novel promoters were designed using the PgroE core promoter as the basis. When the ultra-strong chimeric promoter Pg3 was used to drive surfactin synthesis, the surfactin titer in flasks reached 8.61 g/L, which was 15.6-fold greater than that of wild-type THY-7. However, there are also reports of failures of promoter modification in model strains or other organisms. Coutte et al. reported that the surfactin concentration changed from 1.5 to 1.2 g/L after replacing the PsrfA of the B. subtilis 168-derived strain BBG111 with the constitutive promoter PrepU originating from the replication gene repU of the Staphylococcus aureus plasmid pUB110 . Subsequently, Willenbacher et al. analyzed the effect of promoter replacement in minor and strong surfactin producer strains. They found the surfactin concentration of minor producer strains B. subtilis 3A38 was increased, while the strong producer strains B. subtilis DSM 10T was decreased after substitution of the native promoter using constitutive promoter Pveg, as shown in Table 1 . Overall, to establish genetically modified high-yield surfactin producer strains by promoter engineering, it is necessary to analyze the transcriptome and production capacity of the strain. Targeted construction of a strong promoter or hybrid promoter suitable for each strain may be more suitable. However, it is also necessary to consider that there are many uncertainties in the genetic operating system of wild-type strains, which greatly increases the difficulty of genetic manipulation. The mechanism guiding the transmembrane efflux of surfactin is not very clear, but surfactin has a deep effect on the lipids of biological membranes . As reported, the surfactin monomer can insert itself into phospholipid layers in biomimetic membrane systems at low concentrations (below or near the critical micelle concentration, CMC). At higher concentrations, surfactin can cause membrane solubilization and vesicle destruction . Some researchers speculated that the transmembrane efflux of surfactin may simply be the result of membrane insertion and penetration of surfactin monomers or oligomers . In an early report, Tsuge et al. suggested that there may be a mechanism for surfactin efflux mediated by protein transporters. They found that the production and resistance to surfactin of B. subtilis hosts could be significantly reduced by null mutations in yerp, a gene encoding a protein with homology to RND (resistance, nodulation and cell division) family efflux pumps. The speculation that transmembrane exporters dependent on the proton motive force (PMF) could facilitate the efflux of surfactin in B. subtilis was further confirmed by Li et al. According to the energy source, bacterial transmembrane transporters can be divided into two categories, those dependent on ATP or proton motive force (PMF, i.e. transmembrane proton concentration gradient) . Firstly, Li et al. used liposomes and transmembrane transport inhibitors to confirm that the surfactin efflux in THY-7 was mainly dependent on the PMF, and not ATP hydrolysis. Then, they identified the putative lipopeptide transporter YcxA, which depends on the PMF, unable to transfer surfactin in THY-7 due to a frameshift mutation of the encoding gene. Afterwards, three putative lipopeptide transporters with PMF as energy source were overexpressed, and the secretion of surfactin increased by 89%, 52% and 145% with the overexpression of the natural full-length YcxA, KrsE and YerP proteins. To enhance the efflux of surfactin, proteomics can be used to analyze the differences between key proteins related to efflux in different host strains, especially wild-type strains with high productivity of surfactin. However, the ability of surfactin efflux in the strain needs to be identified first. The mechanism of surfactin efflux and proteins involved in transmembrane transport still need to be further researched. The expression of srfA operon is not only controlled by the promotor Psrf, but also can be regulated by some transcriptional regulatory genes. Bacterial quorum sensing (QS) system, a cell-density-dependent regulatory networks, plays a significant role in the regulation of srfA operon. The two canonical peptides, ComX and CSF, mediate the quorum sensing control of competence and sporulation in B. subtilis [60, 61]. In the late-growth phase, a series of gene transcription events downstream of the ComA-ComP two-component are triggered by the accumulation of a high concentration of peptides, among which the srfA operon is stimulated via a complex-regulation phosphorylated cascade [62–64]. As shown in Fig. 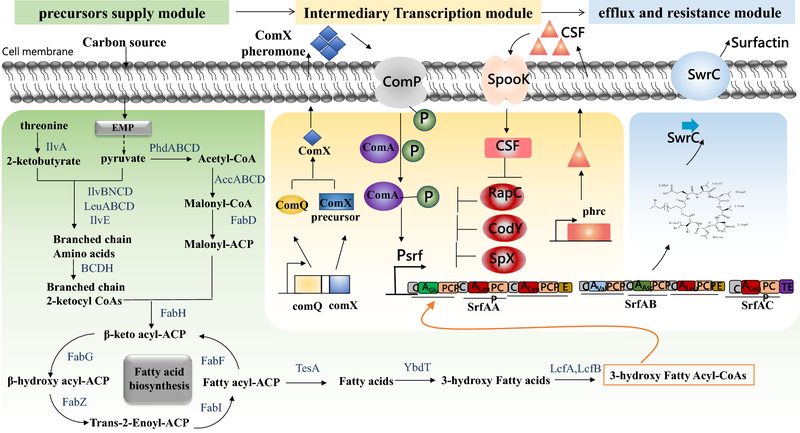 3, both ComX and CSF activate the transcription of the srfA operon by stimulating the activity of transcription factor ComA through phosphorylation (ComA-P) via two separate pathways. In one pathway, the monitor of cell density, the ComX pheromone, is firstly modified by the ComQ isoprenyl transferase to be processed outside. The signal transduction system composed of the two-component regulatory proteins ComP and ComA is activated when the ComX pheromone reaches the obligatory concentration. Ultimately, phosphorylated ComA binds to the promoter (PsrfA) of the srfA operon in tetramer form, and cooperates with SigA to activate the transcription of corresponding gene expression . Another pathway is mediated by CSF, which is encoded by phrC and is initially imported as inactive-form CSF (inact). CSF is imported into the cell by the oligopeptide permease SpooK , and then binds to the Rap protein, which causes the Rap protein losing phosphatase activity. Thereby, the dephosphorylation of phosphorylated ComA can be prevented to facilitate the transcription of srfA gene and synthesis of surfactin . In early research, the expression of srfA was decreased by inhibiting the transcription of the ComQXP quorum-sensing locus in B. subtilis . In addition, Wang et al. found that surfactin production was severely decreased by a mutation of three non-aspartate amino acids in the ComA response regulator receiver motif. Later, Jung et al. confirmed that the overexpression of signaling factor ComX and PhrC could successfully increase the production of surfactin . In addition to the ComX and CSF, the expression of the srfA operon is also regulated through several global regulators and regulatory protein. The global regulator CodY can repress srfA transcription through directly binding to the srfA promoter regions [70, 71]. The codY-dependent repression of srfA transcription can be triggered by high external concentrations of amino acids. Consequently, the surfactin production in B. subtilis 168 derived strains was increased about tenfold through the knockout of codY . The regulatory protein SpX suppresses srfA expression by blocking the interaction between ComA and RNA polymerase (RNAP) in the promoter region via competition for an overlapping site in the α-CTD . Some other negative regulators of srfA was also detailly reported such as PerR, SinI and PhoP [33, 46, 73, 74]. The synthesis of surfactin is closely related to QS, and ComX seems to be a key factor in enhanced surfactin productivity. However, not much is known about the dynamics of the regulatory network or overall synthesized quantities. At present, the surfactin productivity of strains used in studies on the synthesis of QS regulatory genes is generally low. Thus, whether these QS regulatory genes and their regulation in high-yield strains have changed, as well as if there exist other signal peptides like PhrC, awaits further study. Genome sequencing in combination with global transcriptome analysis is an effective strategy to unravel the biosynthesis and regulatory features of surfactin exhibited in high-producing strains; They can provide fundamental information for rational strain improvement via genetic modification or pathway engineering. The general regulatory network of surfactin synthesis could be divided into three functional modules: precursors supply module, intermediary transcriptional driving module and efflux and resistance module, as shown in Fig. 4. Compared to low-producing strain Bacillus amyloliquefaciens DSM7T , the up-regulated expressed genes in high-producing strain B. amyloliquefaciens MT45 mainly be involved in srfA operon expression, precursor redirection, and antibiotic resistance capacity. For example, the srfA operon was up-regulated about 9.25–48.86-fold in high-producing strain B. amyloliquefaciens MT45 . Apart from this, most genes in the fatty acid synthesis pathway, such as fabG, fabZ, fabI and fabF were also up-regulated. Moreover, in efflux and resistance module, swrC (synonymous of yerP) and other two genes acrB and liaRSFGHI operon were all highly expressed. AcrB had high amino acid sequence similarity to SwrC (~ 41%) and liaRSFGHI operon was annotated as genes associated with the resistance of daptomycin (a structural analogue of surfactin). Meanwhile, the srfA operon and swrC were also highly expressed in high-yield strain Bacillus velezensis BS‐37 . Most recently, Wu et al. used B. subtilis 168 as the initial host to construct a surfactin hyperproducer through a systematic metabolic engineering method based on the results of genomics and transcriptomics of Bacillus amyloliquefaciens MT45. Three functional modules in B. subtilis 168 were strengthened via more than 40 steps of manipulations; the final surfactin titer reached up to 12.8 g/L. The surfactin production of this functional strain is also the highest yield reported so far. Compared with the wild strain B. subtilis THY-7 derived high producer recombinants (9.74 g/L), we can speculate that the wild high producers could be more efficient for constructing a surfactin hyperproducer for industrial application, if efficient genetic manipulations were available. In addition to the use of genetically engineered surfactin-producing strains to enhance the production, some strategies were developed to modify the structures of surfactins. Combinatorial biosynthesis, a genetical engineering technique that purposefully alters the biosynthetic pathway of natural products to form predictable new structural products, plays an important role in the structural modification of cyclolipopeptide antibiotics . These novel structural compounds exhibit new functions or activities as expected by the investigator. The strategies for structural modifications are mainly focused on the peptide ring and hydrophobic fatty acid chain. The peptide ring of seven amino acids in surfactin is synthesized by NRPS modules. The site-directed mutagenesis, substitution, insertion, deletion, and reprogramming of peptide modules within a NRPS biosynthetic template can provide an almost infinite recombination potential to generate novel peptides. Under these circumstances, various approaches have been tested to rationally design novel surfactin products, as shown in Table 2. Some modifications were mainly focused on the substrate specificity of NRPS. Previously, the modification of surfactin was conducted by rational module swapping, such as the targeted replacement of the simplest peptide synthetase module SrfA-C [77, 78]. Later, Stachelhaus et al. extended this method to exchange the leucine-activating module within the multi-modular SrfA-A . As a result, ornithine was directly incorporated at the second position of the peptide chain. However, the substitution caused a more substantial modification in the conformation of the peptide product. For example, through structural dissection of the phenylalanine-activating adenylation (A) domain, which is responsible for the specific recognition of the cognate substrate amino acid in nonribosomal peptide synthetases (NRPSs), Eppelmann et al. rationally altered the substrate selectivity of the initiation module C-AGlu-PCP of the surfactin synthetase complex from l-Glu to l-Gln using site-directed mutagenesis . What’s more, a novel surfactin with an l-Asn residue at position 5 replacing the native l-Asp constituent was produced in the same way. Moreover, the NRPS was reprogrammed to be more “clickable” by a single tryptophan-to-serine mutation in the phenylalanine-specific NRPS adenylation domain, which enabled the efficient activation of non-natural aromatic amino acids functionalized with azide and alkyne groups . These results greatly enriched the diversity of peptide modules by “click” reactions, which represent Huisgen cyclizations between alkynes and azides. Decreasing the ring size by means of genetic engineering is another way to produce novel peptide products. Researchers obtained a condensed ring product by deleting the leucine-incorporating SrfA-A2 module of the surfactin NRPS, resulting in a hexapeptide, Δ2-surfactin variant with a decreased ring size . The hexapeptide had reduced toxicity to erythrocytes with higher antibacterial ability. However, due to the instability of the structure, the yield of hexapeptide surfactin was only 5–10% that of the wild-type product, about 25–50 mg/L. Likewise, Jiang et al. knocked out the modules SrfA-A-Leu, SrfA-B-Asp, and SrfA-B-Leu of the surfactin NRPS in B. subtilis BP2-L1, respectively . 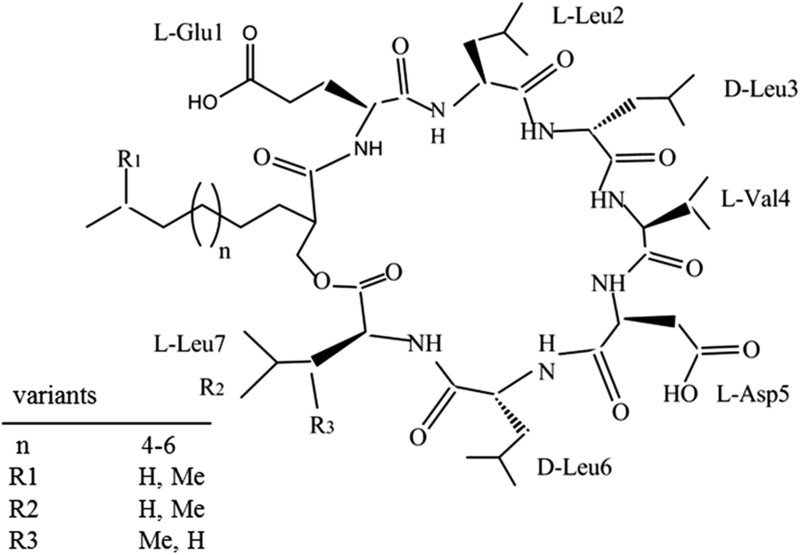 These modifications resulted in three novel hexapeptide surfactins, individually lacking the amino acids Leu-3, Asp-5, and Leu-6. Although [ΔLeu3]surfactin and [ΔLeu6]surfactin showed reduced toxicity, and the [ΔAsp5]surfactin showed stronger antimicrobial activity than the native surfactin, the yields of the novel products were extremely low, only 0.82–1.35 mg/L. Moreover, the size of the peptide ring could be minimized by the deletion of six amino acids, with only a single glutamic acid residue remaining. This surfactin variant, fatty-acyl-glutamate (FA-Glu) had a lower CMC and higher water solubility than myristoyl glutamate, a commercial surfactant. However, the yield of FA-Glu was also low, reaching only about 200–250 mg/L which was 5% of that of the wild-type product [84, 85]. Combinatorial biosynthesis technology presents both opportunities and challenges in developing new surfactant structures and expanding their applications. The reprogramming and deleting peptide modules of surfactin can result in many novel surfactin products with new or better capabilities, but many of the reported engineering attempts faced low product yields or even inactive hybrid enzymes. Indeed, the complexity of the NRPS structure far exceeds people’s imagination. The integrity of the modules and the diversification of the link area always brings uncertainty to the genetic manipulation. The extensive unexpected modification of the peptide-product and the low yield all need to be overcome. Compared with the NRPS-catalyzed synthesis of the peptide structure, the biosynthesis of the fatty acyl structure of the surfactin molecule still needs further research. The fatty acid chain length of surfactin is generally C13–C15, whereby C14 and C15 are usually predominant (60–80%) . The length and isomerism of the FA chain were known to have an impact on the physicochemical properties and biological activity . The antifungal activity and surface activity was enhanced in the order straight (n) > iso > anteiso [86, 87]. The C14 surfactin was found to have higher foaming capacity in comparison to C13 and C15 surfactins [45, 88]. It was also found that a linearized synthetic C14 surfactin showed none or less hemolytic behavior in comparison to cyclic natural C14 surfactin . The fatty acid composition of surfactin has a greater effect on the surface activity than on the surfactin production. Iso-odd fatty acid isomers have higher oil displacement than n-even fatty acid isomers . Our research also proved if the surfactin contained more proportion of C15, the surfactin showed a better oil-washing efficiency and oil displacement efficiency . Therefore, in the study of the structural diversity of surfactin, the directional modification of the fatty acid chain of the surfactin product is of great significance for the application of surfactin. As illustrated in Fig. 2, branched-chain amino acids are closely related to the fatty acyl moiety of surfactin. Hence, amino acids added to the culture medium affect not only the amino acid moiety in the peptide ring but also the hydroxyl fatty acid moiety in the produced lipopeptide. For example, adding Arg, Gln or Val to the medium increased the proportion of surfactin with even β-hydroxy fatty acid components C14 and C16, whereas the addition of Cys, His, Ile, Leu, Met, and Ser enhanced the odd β-hydroxy fatty acids in B. subtilis TD7 . Since then, people began to change the fatty acid composition of the surfactin products by modifying or strengthening the relevant amino acid synthesis pathways. Coutte et al. increased the production of surfactin via intracellular l-leucine overproduction by genetically engineering B. subtilis 168 . Notably, not only the yield of surfactin was maximized, but the structural components of surfactin were also changed after knocking out the global regulatory factor CodY, which inhibits the expression of the ilv-leu operon. The relative proportions of C13 and C14 in the control strain were 39.7% and 21.2%, respectively, which changed to 26.5% and 40.6% after knocking out codY. Later, Coutte et al. further studied the branched-chain amino acid metabolic pathway and found that the proportion of surfactin with linear C14 was increased 2.5 times after knocking out the lpdV gene responsible for the final degradation of branched-chain amino acids . Obviously, it is difficult to produce directional fatty acid structures of surfactin by using exogenously added amino acid components or internally engineered amino acid synthesis pathways. In order to purposefully modify the structure of fatty acids, it is necessary to understand how the 3-hydroxy fatty acids participate in the lipoinitiation reaction of surfactin biosynthesis. Kraas et al. revealed the mechanism of lipoinitiation by functional dissection of surfactin synthetase . In the initial step of surfactin biosynthesis, the substrate 3-hydroxy fatty acid is combined with coenzyme A (CoA) under the control of fatty acyl CoA ligases (FACLs), which activates the acylation of the first amino acid Glu in the form of a CoA-activated 3-hydroxy fatty acid. Furthermore, gene deletion studies of four putative fatty acyl CoA ligases (FACLs) showed that the yield of surfactin was reduced by 38–55% with a single knockout of one gene, while the surfactin yield was about 20–65% when 2–3 genes were knocked out, and decrease by 84% when the four putative fatty acyl CoA ligases were all knocked out. These results showed that fatty acyl CoA ligases have a significant effect on surfactin biosynthesis. It should also be noted that deactivating the four putative FACLs does not result in a complete loss of the ability to synthesize surfactin. It therefore seems that there are still fundamental discoveries to be made, more FACLs need to be found and there are still other pathways providing the fatty acid moiety for surfactin production, for example, through transthiolation from ACPs to CoA. The pool of fatty acid-S-CoA substrates contains many different CoA-activated 3-hydroxy fatty acids which are not all incorporated into surfactin. The SrfAA starter C-domain can catalyze the direct formation of an amide bond between a fatty acyl-CoA and an amino acid moiety. Thus, the substrate selectivity of the C-domain in the initiation module (C-AGlu-PCP) of surfactin synthetase SrfAA plays a more important role in the fatty acyl structure of surfactin. This will give us new insights for the rational design and genetic modification of the fatty acyl structure of surfactin. The C domain of the NRPS synthesis initiation module srfA-A1 may be an important target for fatty acyl structural modification. Changing the specificity of the starter C-domain for fatty acids or swapping the starter C-domains in the initiation module of surfactin synthetase SrfAA for those from foreign NRPSs is a potential way to generate novel surfactin structures with a specific fatty acyl moiety. The exciting work by Kraas et al. was confirmed by Chooi and Tang, who demonstrated that the starter C-domain of SrfAA synthetase is really a worthwhile research subject . Regrettably, there have been no further reports investigating C-domain modification. Surfactin has attracted considerable attention in research and industrial applications due to its various biological and physico-chemical properties, but the current fermentation processes are cost-prohibitive and cannot meet the needs of industrial applications. Controlling the foaming during the fermentation process remains a challenge in the industrial fermentation of biosurfactants. Loss of product, nutrients, and cells caused by foam overflow needs to be solved through process- and reactor optimization. In addition, finding cheap biomass materials is also an effective means to reduce the cost of fermentation and promote the industrial application of surfactin. With advances in genetic engineering and synthetic biology, the construction of strains with high yield, high conversion rate and high production rate will become feasible in the near future. Creating novel surfactin compounds with new structures is also the key to promote their broader application. The studies on NRPS modules and combinatorial biosynthesis technology provide the basis for the modification of the surfactin peptide loop. However, there are still many hurdles to overcome, including the functional connection between modules, uncertainty about the effects of the modified peptide products, and the low yields. On the other hand, there are still no technical means that would enable the directed regulation of the fatty acyl structure of surfactin. Enhancing the de-novo synthesis pathway of fatty acid precursors may be a good strategy to increasing the production of surfactin with a specific fatty acyl structure. The substrate specificity of the initiation module (C-AGlu-PCP) needs to be analyzed further. H-FX and LS overall coordinated, finished the illustrations, and finalized the manuscript. L-YY participated in revising the draft the manuscript. All authors read and approved the final manuscript. Not applicable. The manuscript contains an overview of the literature and all data are available in it. This work was supported by the National Natural Science Foundation of China (No. 21576133) and the Jiangsu Synergetic Innovation Center for Advanced Bio-Manufacture.